on a new premium detector and at the same time you don’t want to buy a new poorly made “cheap” Detector that’s just a step above a “toy”. One of the best options is to pick up a high quality used detector, you can get a great used machine that’s is a few years old but still far far superior ( and half the cost) to some of the new off some new detectors sold today. 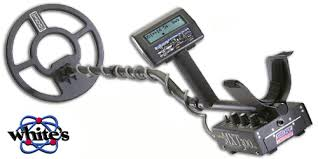 One great metal detector that can be found for a good price on the used market is Whites Mxt 300 Detector. Many reviews overwhelmingly favor the MXT for its ease of use and versatility. That’s important when you are embarking on a new adventure. Ease of use is the key to Whites MXT series metal detectors. It comes with three operating modes that are completely separate from one another. It operates with a toggle switch that can be selected to relic, gold prospecting or jewellery/coin. The Jewellery/coin mode shows a display of between -95 all the way to +94. It also target blocks trash labels and a battery check that is automatic, and alerts for overload and low battery. There is also a knob to adjust gain threshold, discrimination, and a optional trigger mode for “pull tab notched out” for great depth. The relic mode looks for buckles, bullets and buttons. The display also has a range of -95 to +94 and has a distinctive audio response that is like the mixed mode feature which is favored by relic hunters that do it for a living. The prospecting mode is designed after the Goldmaster metal detector also manufactured by Whites. The knob adjustment becomes an adjustment for SAT speed in the prospecting mode. This is one of the better options for gold prospecting. This feature is designed to the specifications of Jimmy “Sierra” Normandi. The operating frequency for the Whites MXT metal detector is 14 kHz and comes with a battery pack that can just drop in. There is also an optional Nicad system that is rechargeable. Another option to consider is the waterproof 300 LTD Super Spider loop that has a high resistance to low seepage. The Whites MXT 300 metal detector can be found on the secondary market in the sub $500 range with a little research and digging . That’s a pretty good deal and worth considering what a quality metal detector you will be getting. The Whites mxt 300 is an excellent metal detector and I hope this review has persuaded you to give it a try, you will not be disappointed.